To use on holiday,to keep phone,Cramer dry, So we can both go in the water together. The bag is filled with on the water fuel for my Son when he is racing. It gets rolled down and clipped around his Topper mast. It keeps the food safe and dry, and it is perfect for easy access. Very well made and a good price for the quality of construction and components. I bought this for my 14 yr old daughter while out sailing to keep snacks in. It can be tied to the mast and she can have dry drinks and snacks as required if out on the boat for a while. we have not used it yet but borrowed one from a friend that looks very similar to this. so Im sure it will do the job just fine. Swim and gym. The waterproof bags are good for anybody who needs to ensure clothing has to stay dry. Bit thinner material than some of the bigger bags, but this is necessary for it to roll over properly at the waterproof seam. I guess this means it's not quite as tough as for example the 30 litre bags (I've had a bigger one for years which's taken a lot of abuse! ), yet relative to it's light weight this still feels very strong. And it doesn't let water through like other brands' lightweight bags I've tried in the past! Pilot gig rowing. Very good quality. Perfect for what I need. Excellent quality and will recommend to everyone. Good product. Capacity quoted is correct for bag when open. Once sealed capacity is reduced. Keeps my valuables dry and safe whilst sailing. A great product for all outdoor sports. Super quality. I actually swapped this over for a larger size, as need to keep clothes dry when fishing is typical British weather!! Fast delivery and perfect for kayaking! Bought for boating for ourselves and another for my son. Perfect size for day out on boat. Great products for everybody that would like to use safe, professional equipment. Can't answer as item bought as a gift however recipient seems very pleased with it. My customer were very excited over the quality of product. works great , very happy with it. Have a kid on a sailing course who uses it for his lunch. 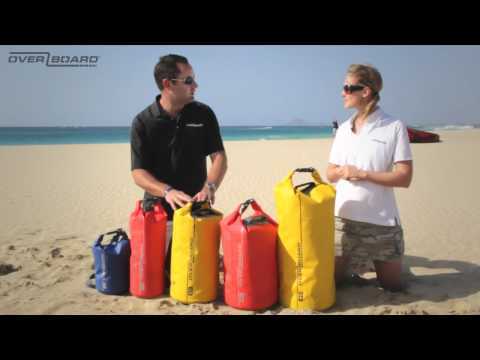 Used on a diving holiday...great product. The product has not been fully tested yet but appears to be in perfect condition. Bought for someone as a gift. He already has one and wanted another colour The bag is used daily, just to go out, ensuring the contents will remain dry. I've bought an Overboard bag before and it's been fantastic! Coming back for a smaller version to carry our stuff to the beach and to protect iPads etc from sand and water. We already have one in yellow and it's been really useful. Easy to clean, robust, whatelse do you need? Using the bag for a trip to Costa Rica. The quality of the construction and material is fantastic. It just about fits my DSLR camera and its carrying bag in but not any space for anything else. Bought for my husband who uses these bags whilst canoeing. Well made product that I will keep on my boat as a grab bag. In fact I bought 5 bags to share with my boat pals at Christmas! I go yachting and this is perfect for when we moor up and need to use the facilities. I can fit a towel, change of clothes and toiletries in it. And if I want to drop by the pub after a shower, it's discreet enough. I bought one in the summer, so now am giving them as Christmas presents. They're great.